Join the discussion on our forums! 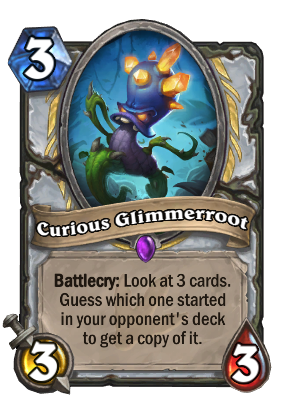 Come discuss Curious Glimmerroot over in our dedicated Curious Glimmerroot discussion topic. No one will probably see this, BUT if you wait to "rope out" while selecting one of the three cards from Curious Glimmerroot, the game will automatically select the right card for you! Try it and see for yourself! I like your card, i think I will TAKE IT! 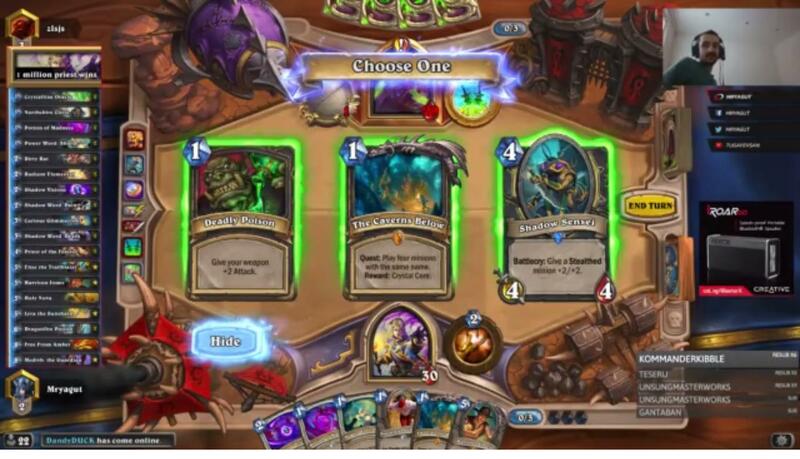 How is this a "guess" if you can pick a card you've already seen played. This card is quite popular in the current meta, if you are running it, what's your correct pick rate, typically? 80%. I generally know what kind of deck I'm playing against after turn 2. I just recently paid dust for this little guy. I wasn't sure if he was a good buy. He is amazing! I currently have 100% correct pick rate but I am confident that I will get one wrong eventually. I have used him less than 10 times. is it possible to show cards from the mulligan as well?? Do they count as "cards that started in your hand"
The pyro said, "created by glimmerroot"
Is it possible to get quests with this card? This quite the tricky bro to use in Arena. In my experience if you use it early on you can just guess or pick anything you like. But closer to the end of the game, especially in topdeck mode, this guy can be great - you've seen most of the opponents deck and have a chance to fish out something nice. I keep seeing people trying to next-level this card. They use the logic "I'm picking this card because I want it; it's unlikely to be the correct answer but it'll be great if it does." Maybe this is just me, but I think that this is incorrect except in the most marginal situations. Obviously, if you're dead on board, when you're presented with a fringe card like Humility that saves you, you won't pick the probable right answer if it doesn't save you. Other than that sort of thing, though, an 80% chance for a decent card tends to be way better than a 20% chance for a great card in my book. More like Furious Glimmeroot; why does he look so angry? His card sounds even sound furious too. @Demonxz95 I dusted golden Hallazeal the Ascended 30 minutes ago. Are you here to haunt me for what I did? crafted two of these bad boys in golden. Fantastic card and gorgeous golden animation.